Catch Trophy Trout in Gatlinburg! Take advantage of our Winter Trophy Trout Special with a 3/4 Day Wade Trip that puts you chasing the biggest and baddest Trout in the Smoky Mountains during the best time of year! Winter is your best chance at catching your own River Monster in the Smoky Mountains. The biggest trout in the land come out of the cover of night and prowl the shallows during the day in search of prey, and to spawn. There is no better time to catch a big fish in the Smokies! No previous fly fishing experience necessary! Rates starting at $112.50 per person! Trip Details; Our Winter Trophy Trout Special is a 6 hour Wade trip that is Catch and Release Only! We supply all the gear you need plus lunch, drinks and an adrenaline filled day! All you need is a fishing license and to dress for the weather. Children are welcome on all of our trips, and we do have waders and gear to fit them! Rates; One angler $190.00 Two or more anglers $112.50 per person We supply a patient, professional fly fishing guide, all the gear you need including, waders, wading boots, fly rods, fly reels, leaders, flies, and tippet. We also bring a nice stream-side lunch consisting of hot soup or chili, sandwiches, and drinks. Our guides do bring along cameras to get pictures of you with your catch! 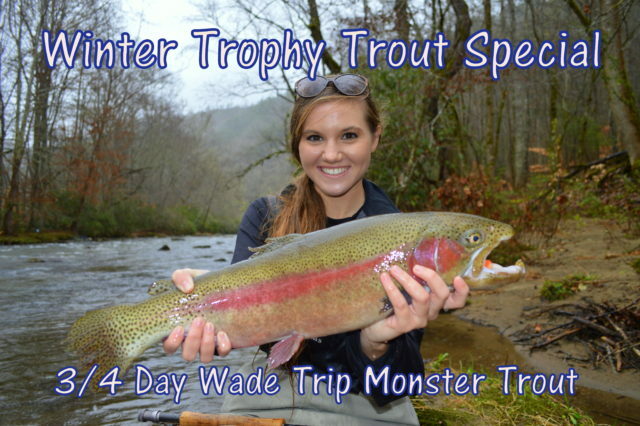 Our Winter Trophy Trout Special is the best deal going, and the best time to be on the water! Winter is when you catch the biggest fish in the Smokies! Book your trip with Fly Fishing the Smokies and make your cast to the fish of a lifetime!